This is a “go with anything” bag. Its large size accommodates all you need and more! 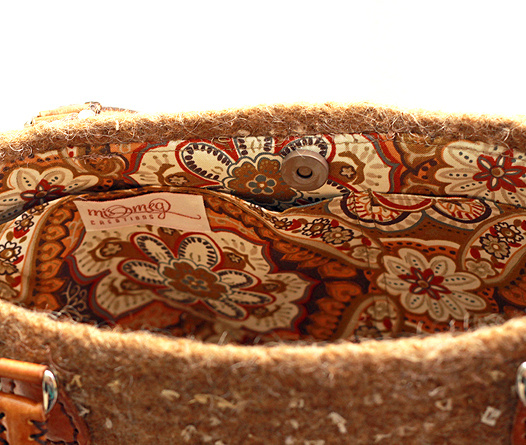 The oaky brown color is accented with hints of novelty yarn and is finished with saddle colored artisan, U.S.A. made, rolled leather handles. A pretty wood circle dangle and gold tassel and beads provide just the right color punctuation. As understated as the bag is, the lining is not! It’s a big and bold retro print in toast, brown, cream and rust. Big pockets line each side, along with a matching key fob. Magnetic snap closure. DISCLAIMER: All photos shown are web representations. Actual colors may vary.